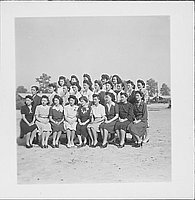 Group portrait of two dozen women seated and standing outdoors at Rohwer concentration camp, Rohwer, Arkansas, November 4, 1944. The women look to the L edge. Woman seated in center of front row wears dark dress embroidered at neckline and sleeves. Barracks in background, L; trees visible in background. 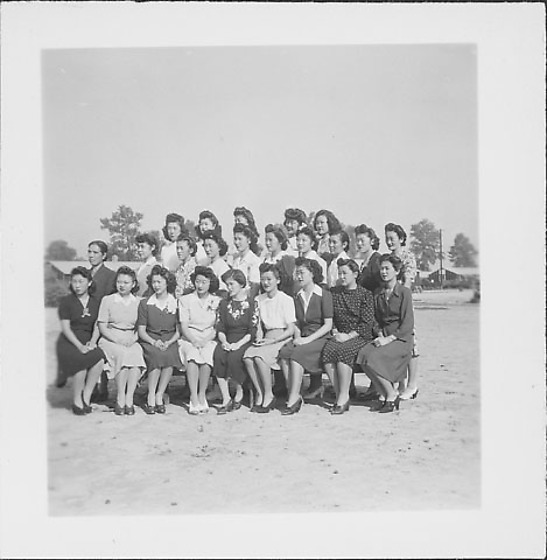 Same image as 97.292.7V ; same group of women in 97.292.7O. Stamped in black ink on back, BR: NOV 4 1944.